Wir sehen in den letzten 4 Jahrzehnten eine Erwärmung. Nach einer (El Nino-) Wärmespitze 2016 geht es nun aber wieder stetig bergab. Die kältesten Temperaturen gab es Ende der 1980er und Anfang der 1990er Jahre. Davor war es wärmer. Um 1980 wurden ähnliche Temperaturen gemessen, wie heute. Leider gibt es keine Satellitendaten aus der Zeit von vor 1979, daher ist noch nicht einmal ein voller 60-Jahres-Ozeanzyklus abgedeckt, was die Zuordnung von anthropogenen und natürlichen Anteilen an der Erwärmung der letzten Jahrzehnte erschwert. From 1999 to 2001 a 724 m deep ice core was drilled on Akademii Nauk ice cap, Severnaya Zemlya, to gain high-resolution proxy data from the central Russian Arctic. Despite strong summertime meltwater percolation, this ice core provides valuable information on the regional climate and environmental history. We present data of stable water isotopes, melt-layer content and major ions from the uppermost 57 m of this core, covering the period 1883–1998. Dating was achieved by counting seasonal isotopic cycles and using reference horizons. Multi-annual δ18O values reflect Eurasian sub-Arctic and Arctic surface air-temperature variations. We found strong correlations to instrumental temperature data from some stations (e.g. r = 0.62 for Vardø, northern Norway). 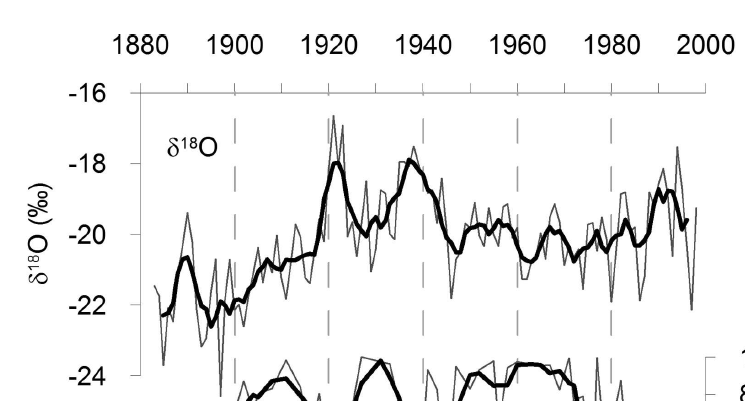 The δ18O values show pronounced 20th-century temperature changes, with a strong rise about 1920 and the absolute temperature maximum in the 1930s. A recent decrease in the deuterium-excess time series indicates an increasing role of the Kara Sea as a regional moisture source. From the multi-annual ion variations we deduced decreasing sea-salt aerosol trends in the 20th century, as reflected by sodium and chloride, whereas sulphate and nitrate are strongly affected by anthropogenic pollution. Ein Teil der Arktis-Erwärmung geht übrigens auf Maßnahmen zur Reinhaltung der Luft in Europa zurück. Die anthropogenen Sulfatpartikel hatten lange Jahre lang die Temperaturen der Arktis gekühlt wie die Universität Stockholm mitteilte (via Science Daily). Sollen wir aus Klimaschutzgründen jetzt wieder anfangen zu ferkeln? The drastic cut in sulfate particle emissions in Europe partly explains the amplified Arctic warming since the 1980s, shows a new study published in Nature Geoscience. The drastic cut in sulfate particle emissions in Europe partly explains the amplified Arctic warming since the 1980s, shows a new study published in Nature Geoscience. The team, which consists of scientists from Stockholm University and the Norwegian Meteorological Institute, say that their surprising finding highlights an even more urgent need for reducing greenhouse gas emissions to mitigate Arctic climate change. Human activities, such as industrial production, transport, power generation, and wood burning emit large amounts of tiny pollutant particles containing, for example, soot and sulfate, into the atmosphere. High airborne amounts of these particles, also known as aerosol particles, cause about 400,000 premature deaths every year in Europe and can be transported over long distances. Aerosol particles have different sizes, as well as chemical and physical properties, all of which determine their climate effects. Sulfate emissions, which cause, for example, acid rain, peaked in the 1980s in Europe and North America, which led to the implementation of strict regulations to reduce them. The new study shows that these policies had a profound effect on the Arctic. “Using a numerical climate model we found that sulfate reductions over Europe between 1980 and 2005 could explain a significant fraction of the amplified warming in the Arctic region during that period due to changes in long-range transport, atmospheric winds and ocean currents. In other words, thanks to air quality regulations implemented in Europe, part of the masking effect of aerosol particles has been reduced, revealing the true warming of the Arctic by greenhouse gases,” says Annica Ekman, Professor at the Department of Meteorology (MISU) and Bolin Center for Climate Research, Stockholm University who also co-authored this study. The scientists expect further warming in the Arctic as levels of greenhouse gases will continue to increase and aerosol particle emissions will likely decrease to combat air pollution in different parts of the world. Aber auch nachträgliche Veränderungen der Messdaten lassen die Arktis heute wärmer erscheinen als sie wohl eigentlich ist (siehe hier und hier). Eine schöne Zusammenfassung zum Klimawandel in der Arktis kann man bei Judith Curry finden.